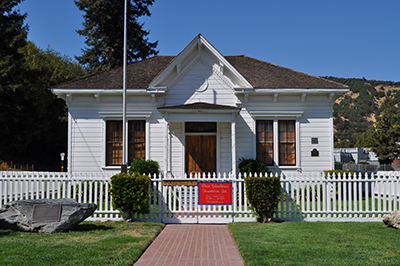 The Dixie Schoolhouse in San Rafael, CA is the oldest one-room schools in Marin County. 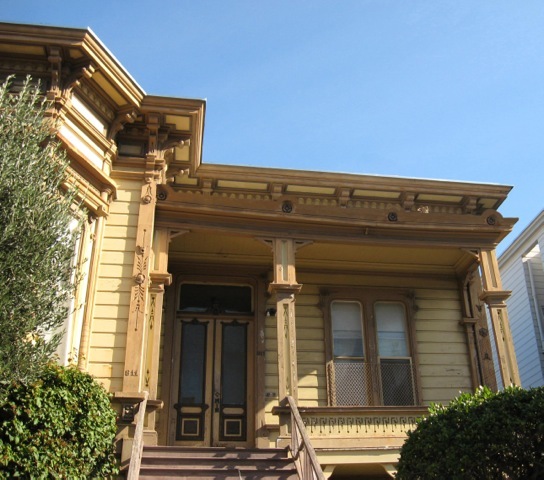 The single story school is a simple adaptation of the Italianate architectural style popular in the earliest San Francisco Victorians. Our roof restoration team replaced the hip roof. This saltbox style farmhouse in the Alexander Valley close to Healdsburg was the home of famed artist Richard Diebenkorn. 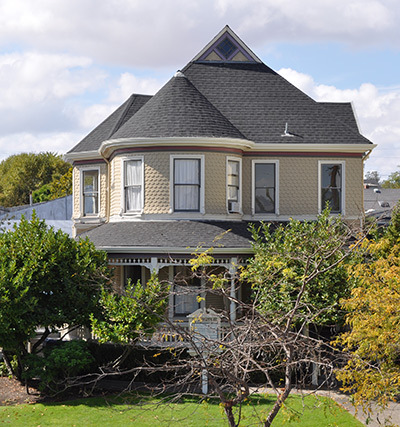 Historic roof preservation of this important home included the installation of a GAF shingle roof and re-installation of the rooftop iron tracery. 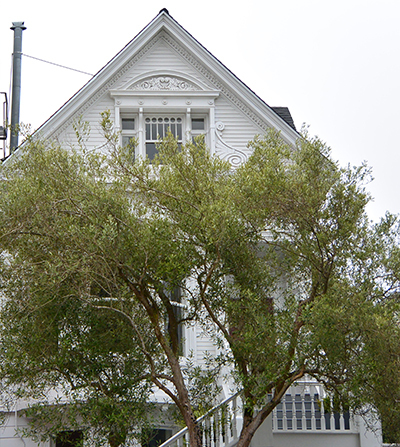 Considered the most prolific San Francisco architect of his time, Henry Geilfuss designed over 450 Victorians in the late 19th century, many now designated as historical landmarks. 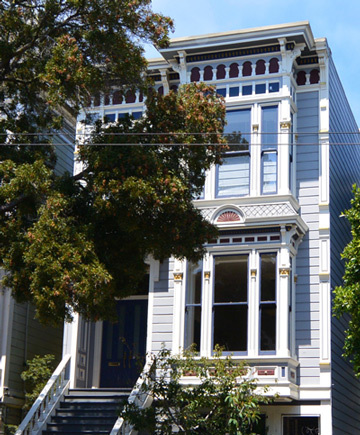 For his own home built in 1882, Geilfuss designed this Italianate-style Victorian Townhouse in San Francisco’s Mission District. The home retains the architect’s signature element of delicate floral embellishments carved into the redwood corner boards and porch posts. Following decades of decline, preservation of this Victorian reached a low point as roof failure allowed interior water infiltration. This critical situation was not only jeopardizing the occupants and their belongings, but also imperiling the integrity of the historic structure itself. The Wedge historical roof restoration team removed multiple layers of built-up roofing, carefully preserving the roof’s exterior decorative elements before installing a new roof system. With a secure, protective roof, the homeowner then could proceed with further renovation of this historic gem. 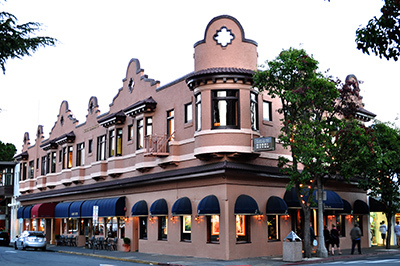 Queen of Petaluma’s historic “Ironfront Row” is the stunning Italiante style “Mutual Relief Building” which was designed by renowned San Francisco Bay Area architect John M. Curtis and features a cast iron facade. Wedge Roofing was honored to be selected to install a new flat roofing system on many of the block of buildings in "Ironfront Row" including the Mutual Relief Building. 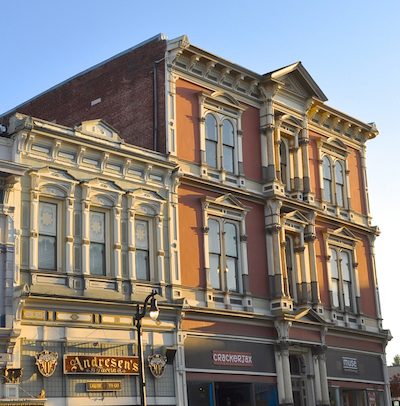 Adjacent to the Mutual Relief Building in the “Ironfront row” of historic buildings in downtown Petaluma is Andresen’s Tavern. 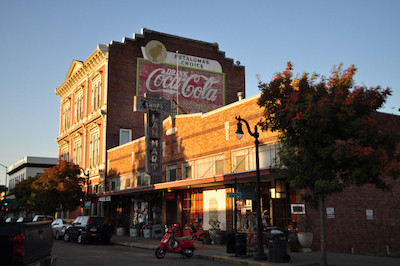 The cast iron facade Italianate designed building was built in 1885. 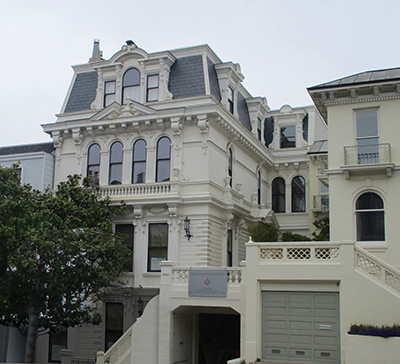 An insulated spray foam roof was installed on this designated San Francisco historic landmark Victorian built in 1889 by Farrell McMorry and designed by architect Thomas J. Wales. 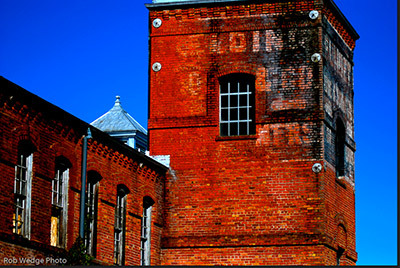 When our roof restoration specialist inspected this historic textile mill, the original tin-plate standing seam roofs were rusted with areas of corrosion allowing interior water infiltration. Our roof restoration team carefully treated the corroded areas and coated the metal roof, pyramidal towers and cupolas. This work successfully halted the water intrusion and extended the life of this historic roof. 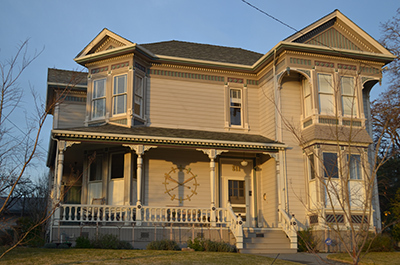 This beautiful 1895 Sonoma County Heritage Home captures the architectural charms of the Queen Anne style. 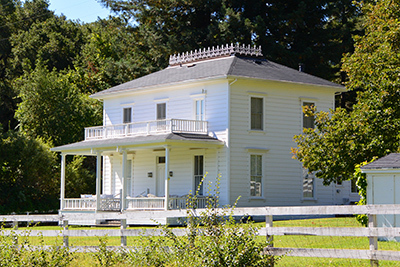 The asymmetrical facade with wrap around porch is highlighted with a corner tower covered in differing patterned wood shingles. Wedge Roofing is proud of our work on this multi-leveled, highly steeped roof with tower and turret. Restoring the original wood shingle roof was not an option, as it lay under many roof recovers. Therefore, the existing roofs were removed to reveal the original rough redwood skipped sheathing boards, which were preserved. Our roof restoration crew installed solid sheathing and a new composition shingle roof. This stunning Gothic Revival Church Designed by Ernest Coxhead, was built in 1909. 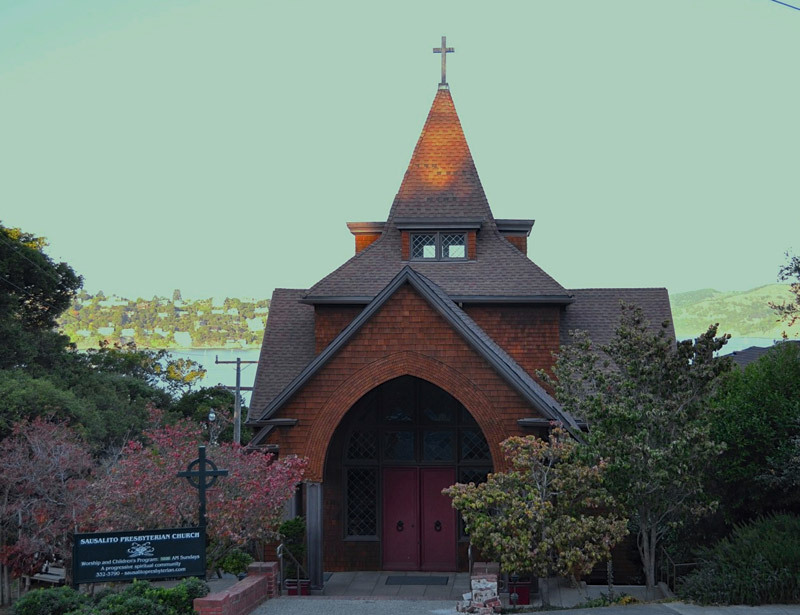 The Sausalito congregation lovingly restored the church in 2002. As part of the restoration team, Wedge Roofing completed refurbishment to the fire-damaged manse and installed a new roof and shingles for the garage. 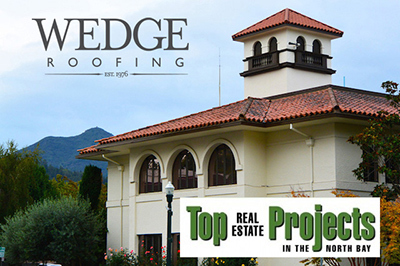 Wedge Roofing's restoration of San Anselmo's historic tower was awarded as the "Top Real Estate Project of 2014" by the North Bay Business Journal. After 75 years, our historical roof restoration returned the San Anselmo Town Hall Tower to W. Garden Mitchell’s original 1911 design. The five-story Spanish Revival style Bell tower, originally built with a clay tile square roof, was modified in the 1930’s for placement of a radio antenna. Working from original 1911 construction images our historic restoration team methodically reconstructed the tile roof and upper section of the tower including the archway, doors and turned balusters. All work was completed accommodating the nesting owls in Marin County's historic tower. 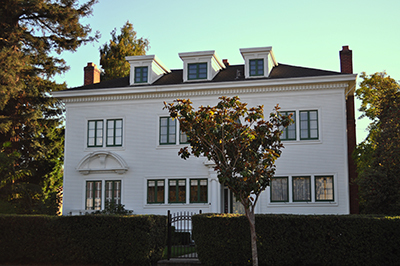 Spray Foam Roofing provided an energy-efficient, watertight roof for Sausalito's historic hotel built by San Anselmo builder Peter Hamilton in 1915. 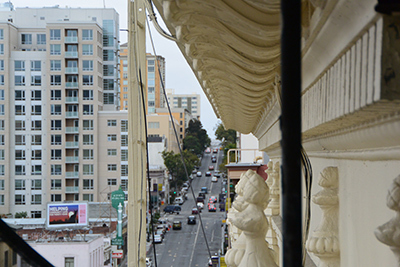 Designed by architect Edward H. Denke in 1923, the stucco cladded six-story Marble Court Apartment is a contributing historic building of the Lower Nob Hill Apartment Hotel District. A key design element of these downtown San Francisco historic buildings is the consistency of the boldly projecting roof cornices. 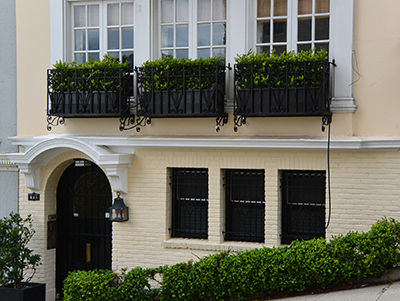 The Marble Court Apartment features an Italianate entablature roof cornice constructed of galvanized iron. 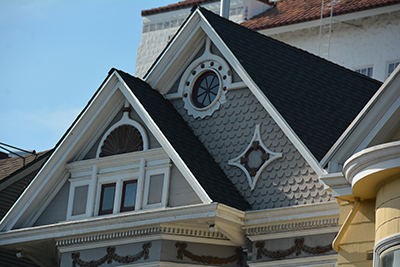 In 2013, amidst adjacent new construction, Wedge Roofing was hired to preserve and restore the structural integrity of the historic apartment’s decorative metal roof cornice. 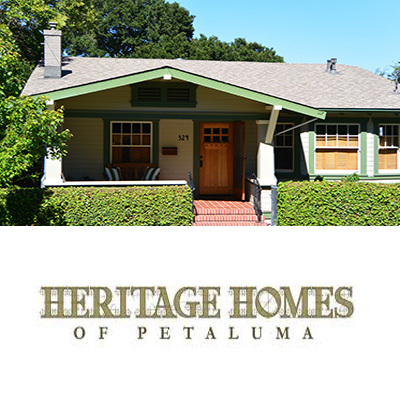 Wedge Roofing’s historic roof restoration and exterior preservation work on this 1924 Craftsman Bungalow was honored with the 2013 Heritage Homes of Petaluma Preservation Award. 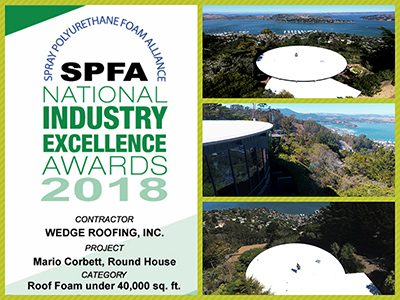 The spray foam roof installation on this Marin County landmark home won the 2018 First Place Award for Best Spray Foam Roof Nationwide from the Spray Polyurethane Foam Alliance (SPFA). Both technically challenging and architecturally significant, the award-winning spray foam roof was installed on a 1954 atomic-era home designed by famed mid-century modern architect Mario Corbett in the Marin County Headlands above Sausalito. To bridge the 1950s-era structure with the consistency and dependability of a contemporary roofing system, Wedge Roofing designed a highly insulating foam roof providing the air-sealing, energy-efficient characteristics not available in the original ceiling and roof assembly construction. After having nightmare roofers in previous projects, it was really a breath of fresh air to find a contractor that isn't trying to cut corners. 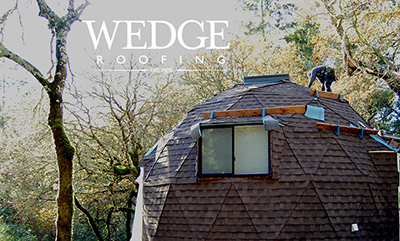 I highly recommend Wedge Roofing."